LCV « Global Market Insights, Inc.
Fuel cell electric vehicle market share is anticipated to display a marked ascent in the forthcoming years, owing to the fact that governments across a host of nations are undertaking various initiatives to bolster the utilization of zero-emission automobiles in a bid to lower greenhouse gas emissions and contain the ever-rising pollution levels. Moreover, it would be prudent to mention that the painstaking efforts being put in by automobile manufacturers in enhancing the existing fuel cell technology and revamping the current infrastructure of fuel cell EV platforms, has invariably created an unprecedented exuberance pertaining to the growth prospects of the global fuel cell electric vehicle industry. Citing an instance to highlight the same, one of the foremost fuel cell electric vehicle market player Ford Motor Company has recently announced that it would amplify its current investment in electric vehicle manufacturing by over two times, taking the figure to a staggering USD 11 billion. Moreover, a range of other dominant fuel cell electric vehicle industry giants including Toyota, General Motors, and Volkswagen have already carved out aggressive plans to manufacture more such vehicles in the next few years. Apparently, the aforementioned declarations undoubtedly showcase a favorable progression path of the worldwide fuel cell electric vehicle market, which garnered a total remuneration in excess of USD 728 million in the year 2016. In the recent times, it has been observed that the leading fuel cell electric vehicle industry players are being benefitted immensely from the noteworthy increase in consumer preference for fuel cell-powered vehicles over battery-powered ones. Apparently, the major advantage of fuel cell-powered vehicles is that they can be charged in lesser time duration than the vehicles running on batteries. Furthermore, fuel cell electric vehicles are known to cover longer distance after a single charge, possess greater off-road mobility, better torque, and enhanced field configuration than the battery-powered vehicles. This goes on to explain the increased focus of a number of fuel cell electric vehicle industry giants on manufacturing fuel cell-powered long-distance trucks and SUVs. As a consequence, long distance traveling automobiles are set to apportion over USD 880 million of revenue share of the overall fuel cell electric vehicle industry by 2024. Speaking along similar lines, Toyota Motor North America, Inc, has recently released its concept truck heavy-duty truck equipped with advanced hydrogen fuel cell system that is expected to broaden the application of zero-emission fuel cell technology. Moreover, the fully functional truck, named as Project Portal, has an exceptional torque capability to seamlessly carry out port drayage operations and transport goods over short and long distances. Needless to mention, the launch of such innovative vehicles would provide a vigorous boost to the global fuel cell electric vehicle market size expansion over the estimated time frame. Meanwhile, it would be prudent to take note of the major factors that are likely to hamper the fuel cell electric vehicle market size progression over the next few years. Establishing a robust network of fueling stations has always been a matter of contention across the globe as it requires a substantial amount of investments. Taking this shortcoming into consideration, the renowned fuel cell electric vehicle market player General Motors Company has recently unveiled a new fuel cell platform, christened as Silent Utility Rover Universal Superstructure (SURUS), which has reportedly been designed for variegated vehicle models. The latest platform is being described as a significant development considering the use of microgrids in military applications. Furthermore, the platform has been developed in such a manner that it would double up as a stationary power source to charge the electric vehicle. The US Army is expected to be the first to utilize SURUS on a wide scale, given that it is already experimenting with semi-autonomous convoys to strengthen its existing fleet of fuel cell electric vehicles that cover long distances. As regional and international regulatory agencies are determined to reduce carbon emissions coupled with the extensive efforts being deployed by leading fuel cell electric vehicle participants, the popularity of fuel cell-powered vehicles is anticipated to soar over the next seven years. In addition to this, the robust growth being witnessed across global renewable energy sector would favorably influence the fuel cell electric vehicle market size that is estimated to surpass 300 thousand units by 2024 in terms of volume, with a remuneration portfolio of over USD 9 billion over the same time span. 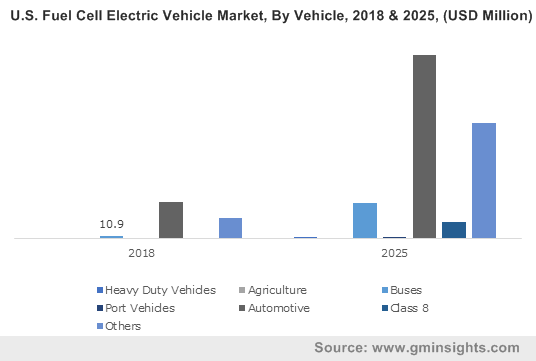 This entry was posted in Automotive & Transportation and tagged E-Bikes, Forklifts, Fuel Cell Electric Vehicle Market, Fuel Cell Electric Vehicle Market Size, Global Fuel Cell Electric Vehicle Market, HCV, LCV, Long Distance, PCV, Short Distance. The latest scoop making headlines in the Europe ADAS market is that of Italian super sports automaker, Maserati launching an upgraded version of its Ghibli sedan incorporated with new advanced driver assistance systems. Maserati’s initiative is clearly remnant of the developments underlining advanced driver assistance system (ADAS) market, that is currently moving ahead at a significant pace. Having recognized the extensive benefits of ADAS systems, numerous automakers have been working toward deploying this feature in their latest automobile brands. This paradigm shift toward implementing safety systems in vehicles on account of the increasing number of road accidents is certain to stimulate ADAS market trends. In the face of potentially hazardous driving scenarios, autonomous systems have been taking increasing precedence in recent times. Consequently, major players in advanced driver assistance system industry are focusing on the development of advanced automated ADAS systems. In order to retain a control over driving, these systems are embedded with features like emergency braking, lane keeping, automatic parking, and adaptive cruise control. The incorporation of additional features such as machine learning and ADAS vision have even enabled vehicles to adapt themselves to adverse climatic conditions. In this respect, a brief outline of the contribution made by ADAS market firms in launching diverse live-saving technologies is enumerated in the paragraphs below. 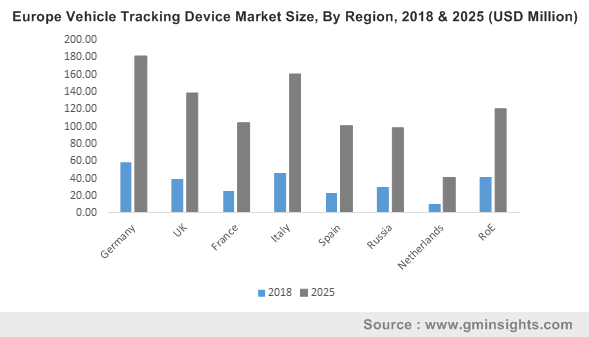 In order to expand the scope of smart transportation globally and consolidate their stance across myriad geographies, ADAS market players have been establishing partnerships with reputed technology providers. Recently, Jaguar Land Rover collaborated with Waymo to develop the first premium self-driving EV in the world for Waymo’s driverless transportation service. Waymo is also expected to work with Jaguar for designing the firm’s self-driving Jaguar I-Pace vehicles. This integrated partnership is a pivotal instance demonstrating the impact of lucrative liaisons in ADAS market. The Indian OEM Tata Motors has scarcely extended its partnership with the pioneering technology provider, Wabco, having already deployed the latter’s ADAS facility in its vehicles. Tata has also conveniently implemented a collision mitigation system (CMS) and a lane departure warning system (LDWS) for its Signa and Prima trucks. The move apparently, is targeted toward the minimization of road accidents and the provision of occupant safety. Having already been a strong player in the India automotive industry, Tata, through this partnership, will further strengthen its position in the regional ADAS market as well. In 2018, one of the prominent China-based heavy-duty truck manufacturers, Sinotruk Limited, extended its cooperation agreement with WABCO Holdings Inc., that supplies advanced technology for enhancing efficiency, connectivity, and safety of commercial vehicles. The deal is anticipated to substantially improve WABCO’s capability in innovative technologies such as ADAS, AMT, EBS, and ECAS. Incidentally, this agreement has so far, spanned almost three decades, and stands as a classic evidence to the fact that long-term business deals across the automotive sector are certain to propel advanced driver assistance system market size over the years ahead. Although ADAS is one of the benchmark features introduced in automotive industry, it has been found that the system is massively prone to cyber-attacks. 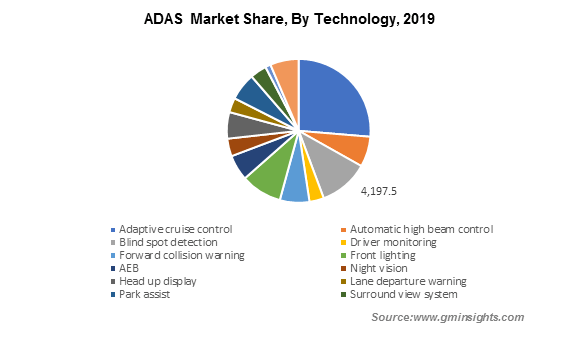 Therefore, numerous ADAS market giants have been continuously working on LIDAR and Radar sensors to control cybersecurity threats. Tech companies are playing their part in eliminating security issues as well and have been found developing advanced solutions to improve security measures in ADAS systems. In this regard, recently, Groupe PSA collaborated with Harman International to design a cyber security strategy for protecting connected and next-generation autonomous vehicles. The collaboration is a vivid indicator of the fact that the growing concerns regarding cyberattacks and protection capabilities of ADAS integrated vehicles will play a pivotal role in augmenting advanced driver assistance system market outlook. The rapidly shifting trends toward the adoption of technologically advanced vehicles are thus likely to fuel ADAS industry share in the ensuing years. As the demand for such vehicles continues to increase along with changing consumer preferences, companies in ADAS market will be looking forward to launching advanced safety solutions. In accordance with the same, strategic collaborations, joint ventures, and R&D program are expected to become highly commonplace in ADAS industry soon enough. Driven by a supportive regulatory spectrum and the robust requirement of technically developed automotive parts, advanced driver assistance system market size is forecast to exceed USD 67 billion by 2024. This entry was posted in Automotive & Transportation and tagged Adaptive Cruise Control, ADAS Market Forecast, ADAS Market share, ADAS Market Size, Advanced Driver Assistance System companies, Advanced Driver Assistance System Market Trends, Advanced Driver Assistance Systems Market, Advanced Driver Assistance Systems Market Report, Advanced Driver Assistance Systems Market Share, AEB, Aftermarket, Automatic High Beam Control, Autonomous Park Assist, Blind Spot Detection, Driver Monitoring, Forward Collision Warning, Front Lighting, Global Advanced Driver Assistance Systems Market, HCV, Head Up Display, Image Sensor, Infrared, Lane Departure Warning, LCV, LiDAR, Night Vision, OEM, Park Assist, PCV, RADAR, Surround View System, Tire Pressure Monitoring System, Traffic Sign Recognition, Ultrasonic. 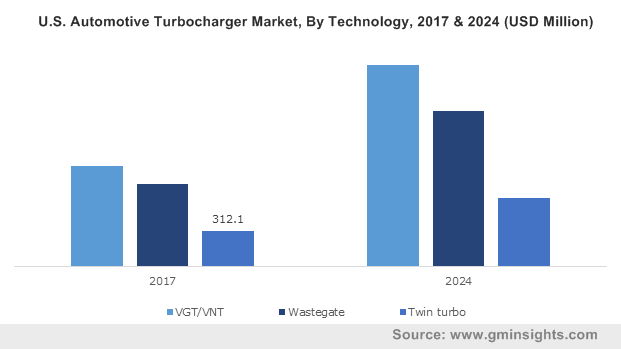 The progressive shift toward a greener, environment-friendly future has been a major driving force for automotive turbocharger market. In an era riddled with the fear of carbon emissions destroying the planet, automakers have been facing several challenges to optimize vehicle efficacy in the best means possible. Consequently, most of the automakers have now been working on bringing about suitable design and operational changes in turbochargers – the highly efficient components that play a major role in downsizing engine emissions. Including the likes of Honeywell and Mitsubishi, renowned companies have thus basically been targeting 2 essential factors – fuel efficiency and emission reduction to bring about a change in turbocharger production, contributing toward automotive turbocharger industry growth. The incredible advantages of these induction devices have ensured an escalating demand for renewed turbocharging technologies. In consequence, pivotal automotive turbocharger market players have been working toward extending their regional reach by constructing new production facilities across various geographies. An instance validating the same is that of BorgWarner having opened its new turbocharger technology production plant in Thailand recently. Through this initiative, BorgWarner aims to provide clean and efficient turbocharging solutions for hybrid vehicles and EVs across the Asian turf. BorgWarner’s plan is also expected to encourage numerous other automakers to expand their already established production facilities in Thailand, that would further help consolidate Asia automotive turbocharger industry. Incidentally, this hasn’t been BorgWarner’s first brush with turbocharger technology. In 2017, the company had successfully installed its advanced turbocharging technology into Jaguar Land Rover. The turbocharging system was expected to help Jaguar Land Rover achieve its engine performance target and fuel efficiency from its new SUV models. Of late, numerous light and passenger commercial vehicle manufacturers are also deploying advanced turbocharging technologies for improved fuel efficiency, suitably impelling PCV sales across major geographies. As per the estimates, PCVs are expected to stand as a dominant vehicle segment in automotive turbocharger market landscape over 2018-2024. Honeywell has been another lucrative player in automotive turbocharger market that has helped strengthen the competitive spectrum of this business space. The company, a couple of years ago, displayed some of its turbocharger technologies for commercial vehicles at the IAA Hannover 2016. Since then, the company has worked consistently to bring forth advanced turbo technologies for on and off-highway powertrains. The firm has also developed a supremely high-efficiency serial two-stage system to ensure optimum performance in heavy-duty long haul trucks that require to be characterized by increased fuel efficiency and lowered CO2 emissions. Bringing about innovative product developments is expected to remain one of the prime growth strategies of automotive turbocharger market contenders. The principal aim here is to develop highly advanced products, the design of which would contribute toward maximum engine downsizing. Electric turbochargers for instance, one of the latest trends in automotive turbocharger market, has been found to eliminate turbo lag, which leads to an increase in fuel efficiency. That said, there is no dearth of R&D programs in this business space, that would help alter conventional turbocharger designs as required and further contribute toward transforming automotive turbocharger industry trends. In the years to come, turbochargers are expected to gain extensive traction in the global automotive space, owing to their substantially high efficiency and their contribution toward environmental safety. Of late, products such as variable geometry turbochargers (VGT) have also gained mass momentum, exceeding their counterparts, due to their cost-effectiveness and technical benefits. Driven by their massive demand on account of the increasing need for a greener environment, automotive turbocharger industry, supported by a strict regulatory framework, will surpass a revenue collection of USD 24 billion by 2024. This entry was posted in Automotive & Transportation and tagged Aftermarket, Automotive Turbocharger Industry, Automotive Turbocharger Manufacturers, Automotive Turbocharger Market, Automotive Turbocharger Market Report, Automotive Turbocharger Market Share, Automotive Turbocharger Market Size, Automotive Turbocharger Market Trends, Diesel, Gasoline, Global Automotive Turbocharger Market, HCV, LCV, OEM, PCV, Twin Turbo, VGT, VNT, Wastegate. Powered by the rapidly expanding automotive industry across myriad geographies, automotive brake caliper market has indeed gained tremendous popularity in recent times. The automotive sector is also rife with a plethora of highly unique innovations that have undeniably had an impact on this business sphere. Indeed, given the pivotal significance of braking systems, technological advancements form the crux of automotive brake caliper industry. Recently for example, Brembo unveiled an aesthetically revolutionary brake caliper at the 2018 NY Auto Show. Apparently, this product helped achieve substantial weight savings – around 400 g per wheel. Brembo’s product launch is indicative of the fact that automotive brake caliper market will continue to be characterized by highly innovative solutions that would optimize performance and improve aesthetics. The automotive industry has registered an extremely appreciable CAGR in the Asia Pacific region since the last decade or so. This growth can be essentially credited to the rise of the middle-class populace with increasing disposable incomes and a growing inclination toward leading a more comfortable lifestyle. 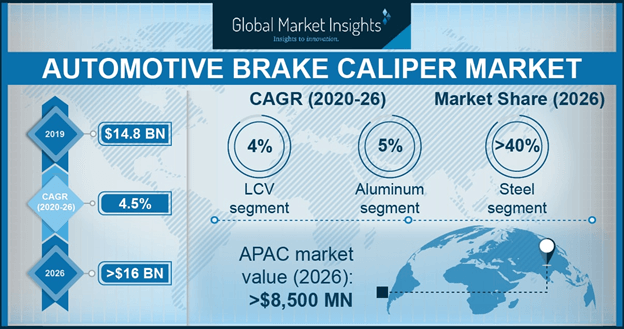 Due to the presence of affordable and efficient production facilities and increased rate of automobile production, Asia Pacific automotive brake caliper market is poised to grow by 3% over 2017-2024. China, India, Japan, and South Korea are projected to be the major contributors toward this regional market, powered by the enhanced automotive manufacturing technologies now prevalent across these economies. Speaking along similar lines, the increasing demand for automobiles among the middle-class consumers has led to a significant requirement of passenger carrying vehicles. For instance, in 2017 alone, 73.46 million units of PCVs were sold – a marked increase of 1.08 million units. 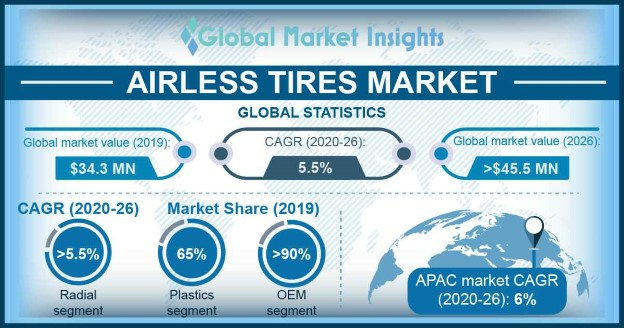 Driven by the increased consumer spending and the subsequent rise in vehicle production, automotive brake caliper market size from PCVs is expected to increase by 3% over 2017-2024. While PCVs take the cake in terms of popularity, it is prudent to mention that two-wheelers are also being increasingly preferred lately, especially in the emerging economies. Two wheelers offer a means of cost effective transportation and are the preferred choice not only in congested cities but also in remote locations. This would perpetually augment automotive brake caliper industry outlook in the ensuing years. Stringent safety and environmental policies have encouraged technological advancements in the automotive brake caliper market of late. For instance, the French auto manufacturer Bugatti has brought forth a unique innovation in automotive brake caliper industry with the use of 3D printing to print titanium brake calipers. Incidentally, 3D printing of brake calipers helps in reducing the overall weight of the vehicle while maintaining torsional stiffness – a highly sought-after parameter in the automotive industry today. Traditional aluminum alloy brake calipers on Bugatti vehicles weigh 4.9 kg each, however, 3D printing of brake calipers makes each caliper weigh just 2.9 kg, which goes a long way in reducing overall vehicle weight and meeting environmental regulations. Though 3D printing of brake calipers has not yet become a mainstream procedure owing to the time-consuming nature of the process, the concept has gained sufficient traction. Other methodologies for the reduction of caliper mass, improved styling and performance maintenance are also being researched currently to reduce particulates and carbon emission in the atmosphere. The emergence of electric vehicles and hybrids is expected to add a new vertical to automotive brake caliper industry, as these vehicles will invariably use a whole new braking system that has little resemblance with the conventional braking system. With the introduction of the Tesla Model 3, electric passenger cars are poised to become the dominant trend for the future. It is rather overt that such cars are being designed to have only one paddle for moving or stopping the vehicle. While the brake system will not be made entirely obsolete, it is certain to undergo some highly innovative changes, that would certainly have an influence on automotive brake caliper market outlook. Research & development programs are rampant across the automotive industry of late and are likely to majorly transform automotive brake caliper market trends. With the robust growth of automated technologies and the increasing requirement for better mobility, automakers are leaving no stone unturned to bring forth newer and enhanced brake systems. In consequence, this would have a commendable impact on automotive brake caliper market size, anticipated to cross $25 billion by 2024. This entry was posted in Automotive & Transportation and tagged Aftermarket, Aluminum, Automotive Brake Caliper Market, Automotive Brake Caliper Market Share, Automotive Brake Calipers Market, Automotive Brake Calipers Market Size, Fixed, Floating, Gravity Die Casting, HCV, High Pressure Die Casting, LCV, OEM, PCV, Phenolics, Piston Material, Steel, Titanium, Two-Wheelers. Ultrahaptics’ latest launch of a new gesture technology platform, STRATOS, is creating waves of anticipation in automotive gesture recognition market. Incidentally, this platform has the ability to create haptic sensations in mid-air. In the automotive infotainment system, mid-air haptic feedback and gesture recognition technology is collectively used for making the controls more intuitive and safer. In this regard, STRATOS is likely to gain traction in automotive gesture recognition market. The increasing use of high-quality HMI (human machine interface) for reducing easier integration and faster processing modules in automobiles will also majorly boost automotive gesture recognition industry share. In 2015, the well-known luxury carmaker, BMW incorporated a gesture recognition and touchscreen to its next-generation human-machine interface. This highly advanced iDrive up-gradation could also help rear passengers to command infotainment system and control ventilation and positioning through a tablet. In addition, this enhanced technology provides ease of user-friendliness for drivers and passengers to operate infotainment & navigation systems as well as smartphones. In fact, for controlling the entire gesture system, BMW used a camera mounted on the roof, which permits users to control all the features just by rotating their hand in clockwise or anticlockwise directions. In this regard, it is prudent to mention that hand authentication systems will cover over 60% share of automotive gesture recognition industry share by the end of 2024. The subsidiary of the reputed Indian automotive company, Tata Motors, Jaguar Land Rover, in 2015, collaborated with the start-up firm Ultrahaptics to develop ultrasonic free-space haptic technology. This ultrasonic gesture recognition can be used for the functioning of in-car infotainment systems. The technology creates 3D objects in mid-air so that the driver can track any action very quickly without taking his eyes off the road. The growing acceptance of such haptic control systems by various luxury car manufacturers is poised to push automotive gesture recognition market size. The leading German automobile manufacturing company, Continental, had planned to incorporate gesture control in steering wheels in 2016. Currently, in order to operate infotainment systems, drivers are required to take their hands off the wheel. However, with Continental’s new gesture facility, the driver can minimize the distraction and improve passenger safety in a much better manner. Through the deployment of innovative human-machine interface in vehicles, automakers are looking forward to strengthening the intuitive communication between the vehicle and the driver. This new approach of Continental is likely to remove all touch-sensitive surfaces and buttons on the steering wheel. In fact, this design will help vehicle manufacturers to optimize the cost of the steering system. Continuous design innovations and system developments comprising gesture recognition system are thus slated to have a positive influence on automotive gesture recognition industry outlook. As of now, gesture recognition is one of the upcoming research areas for automotive giants. 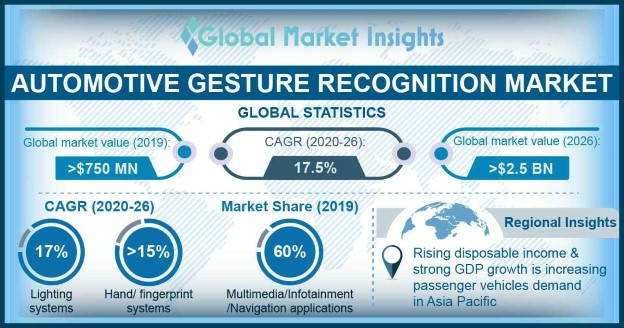 The leading players in automotive gesture recognition market are continuously working on inventing advanced applications for making interactions convenient, natural, and easy. Automakers have also been prominently involving themselves in automotive gesture recognition industry, which is likely to augment product demand over the years ahead. This entry was posted in Automotive & Transportation and tagged AC Blower, Automotive Gesture Recognition Market, Automotive Gesture Recognition Market Analysis, Automotive Gesture Recognition Market Size, Door, Face, Fingerprint, Global Automotive Gesture Recognition Market, Hand, HCV, Infotainment, Iris, LCV, Multimedia, Navigation, PCV, Sunroof, Touch Based Systems, Touchless Systems, Vision, Window.